A look at the towering twentieth-century leader and his lifestyle that goes beyond the political and into the personal. Countless books have examined the public accomplishments of the man who led Britain in a desperate fight against the Nazis with a ferocity and focus that earned him the nickname "the British Bulldog." Churchill Style takes a different kind of look at this historic icon -- delving into the way he lived and the things he loved, from books to automobiles, as well as how he dressed, dined, and drank in his daily life. 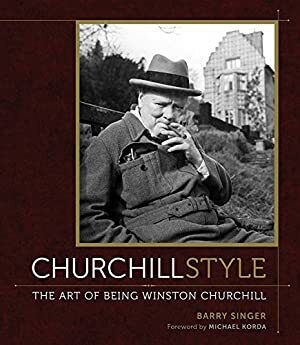 With numerous photographs, this unique volume explores Churchill's interests, hobbies, and vices -- from his maddening oversight of the renovation of his country house, Chartwell, and the unusual styles of clothing he preferred, to the seemingly endless flow of cognac and champagne he demanded and his ability to enjoy any cigar, from the cheapest stogies to the most pristine Cubans. Churchill always knew how to live well, truly combining substance with style, and now you can get to know the man behind the legend -- from the top of his Homburg hat to the bottom of his velvet slippers. Log In to track Barry Singer on eReaderIQ. to be notified each time the price drops on any book by Barry Singer. to stop tracking Barry Singer. Log In to track Michael Korda on eReaderIQ. to be notified each time the price drops on any book by Michael Korda. to stop tracking Michael Korda. The price of this book has changed 123 times in the past 2,514 days. The current price of this book is $13.49 last checked one day ago. This lowest price this book has been offered at in the past six months is $2.51. The lowest price to date was $1.99 last reached on August 4, 2018. The highest price to date was $17.40 last reached on May 8, 2018. This book has been $17.40 one time since we started tracking it. We last verified the price of this book about one day ago. At that time, the price was $13.49. This price is subject to change. The price displayed on the Amazon.com website at the time of purchase is the price you will pay for this book. Please confirm the price before making any purchases.